The Cobra is an innovative, non-mydriatic, digital fundus camera that combines all of the functions needed for fast retinal screening. 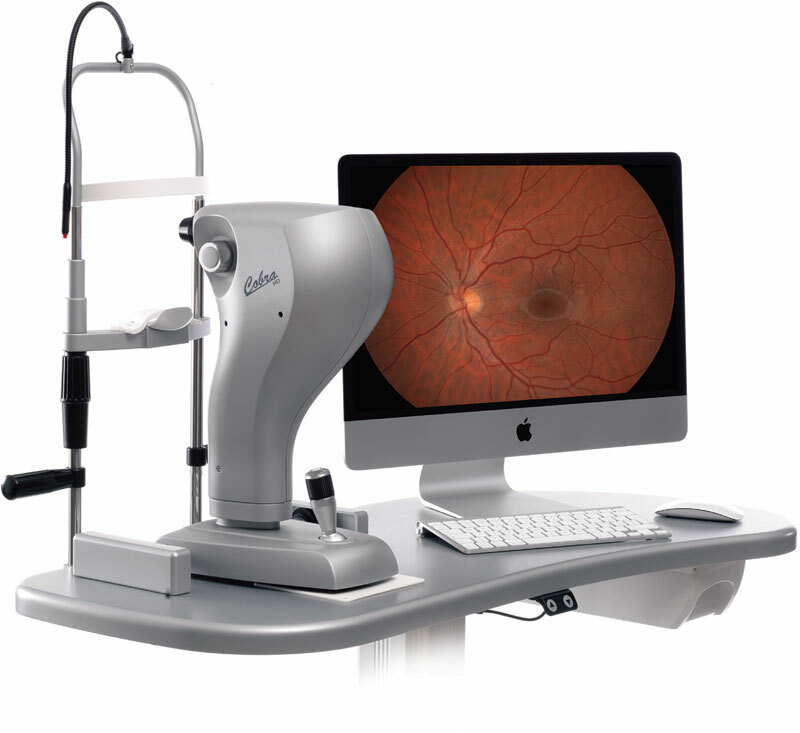 By using its new optical system, the Cobra provides high quality retinal pictures. With its ergonomic design, the Cobra provides a clear and detailed vision of the entire ocular fundus, with a 50 degree, horizontal field of view. Pictures are acquired with minimal flash, which in turn allows for minimizing a patients exam time. The high resolution CCD sensor (5MP in the HD version) is both used for the patient alignment (with an IR source) and for the retinal picture acquisition (with a white LED flash and IR). The Cobra connects directly to a PC via a USB 3 cable, which in turn allows for a very high data transfer rate between the devices. Patient data is saved in a database, provided by Phoenix software. Standalone or network station options are both available. DICOM features are integrated within the Phoenix software. Acquire a very detailed picture with its integrated, colour, digital camera. The Cobra HD provides the new Retimax plus fundus tool, that adds a multifocal ERG test feature, by combining multifocal ERG and photography of the retinal fundus. This helps in the detection and observation of progression in the macular and other limited retinal areas. Showing, on screen, the original picture, infrared, red-free, choroidal component, vascular and optic fibre. InfraRED pictures are acquired using an LED infraRED light source. By using manual acquisition, the Cobra can acquire pictures from different retinal zones with the possibility to show a wider retinal vision thanks to its mosaic function. The mosaic function allows you to compose pictures of different targets, together on the screen, at an 80 degree field of view. Suitable for a pupil size as small as 2.2mm. The new AVr tool provides an advanced and complete screening of the cardio-vascular health of the patient, by performing an analysis of the health of the arteries and veins in the ocular fundus. An index called AVr (Arteriolar-To-Venular ratio) provides a risk percentage for a 3 year period. The Cobra includes an advanced tool for Meibomiam Glands Dysfunction (MGD) analysis. This tool, through taking an easy, colour photograph, and without the use of any additional accessories, provides an evaluation of the glands loss criticity (5 steps scale).